Patanjali had the chance to match the offer by June 16 under the Swiss Challenge method. But reports suggest that Patanjali has not revised its offer of Rs 5,700 crore, therefore paving way for Adani Wilmar to takeover Ruchi Soya. Adani Wilmar is on its way to acquire debt-stricken Ruchi Soya. 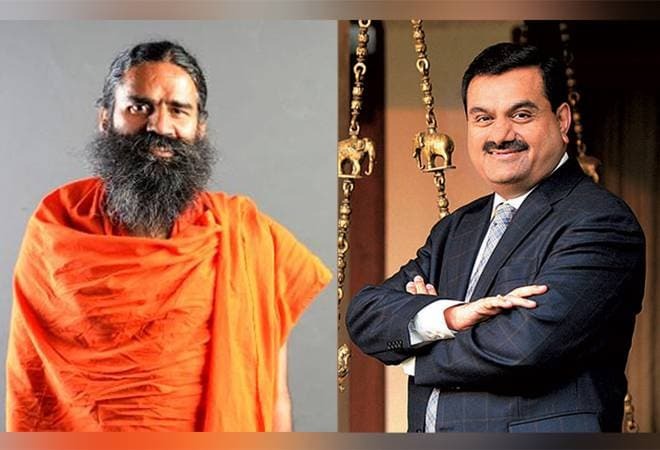 Almost half a dozen firms had submitted their bids for insolvency-bound company but in the end the fight was between Guatam Adani-led Adani Wilmar and Baba Ramdev's Patanjali Ayurved. Adani has offered to pay Rs 6,000 crore for Ruchi Soya - Rs 300 crore more than Patanjali. According to a report in the Times of India, Patanjali did not give any reasons to lenders for not improving its bid. Last week, a committee of creditors or CoC opened the bids submitted by Adani Wilmar and Patanjali in the fresh round of auction under the Swiss Challenge method. Ruchi Soya in a regulatory filing had confirmed that the CoC declared Adani Wilmar as H1 (highest) bidder and Patanjali stood as H2 (second highest). In the first round, Patanjali had emerged as the highest bidder with an offer of around Rs 4,300 crore. Adani Wilmar had offered to pay Rs 3,300 crore. However, the creditors committee was not happy with the initial bids. The CoC then set the stage for an aggressive bidding between the two competitors to maximise the value of the assets under Swiss challenge method. The Swiss Challenge method refers to a system where any person with suitable credentials can submit a development proposal to the government for a public project. The proposal will be then put online and a second party can give suggestions to improve and challenge that proposal. The lenders are expected to meet next week to decide on the highest bidder. Patanjali Ayurveda had earlier questioned the neutrality of the process as the law firm Cyril Amarchand Mangaldas which was advising the resolution professional was also advising Adani Wilmar. Later, the law firm resigned as the counsel to Adani Wilmar, but continued to advise resolution professional. Ruchi Soya owes around Rs 12,000 crore to a consortium of 16 lenders and was referred to bankruptcy court last year as part of the 28 accounts referred to by the Reserve Bank of India. The firm was admitted for the insolvency resolution process after two financial creditors-- Standard Chartered Bank and DBS Bank -- had moved the NCLT on December 15, 2017. The Indore-based firm has many manufacturing plants and its leading brands include Nutrela, Mahakosh, Sunrich, Ruchi Star and Ruchi Gold. Patanjali already has a tie-up with Ruchi Soya for edible oil refining and packaging.